The Soleus CFM40E Dehumidifier is suitable for small to medium sized areas with a maximum water extraction rate of 40 pints every 24 hours. Notable features of this machine are its low noise level, only 41dB at its lowest fan speed and its capacity to operate at only 36°F. This dehumidifier has all the features needed for use in the home although it is a little more basic in one or two respects than some similar machines. The Soleus CFM40E is portable. 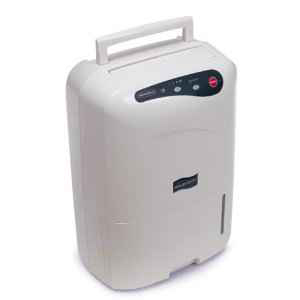 At a weight of just under 31lbs, around the same as a typical three year old child, this dehumidifier is quite easy to lift and carry using the top-mounted handle. Caster wheels are also fitted so it can moved without undue effort across the room, for example to vacuum clean the floor beneath. This dehumidifier is also quite compact which makes it more convenient for homes where space is a little tight. The Soleus CFM40E has an adjustable humidistat which allows relative humidity to be set within a range of 50 to 70%. This range is quite adequate for most purposes although it is quite narrow compared with similar models from some other manufacturers. It is also a little inflexible as only three levels, 50, 60 or 70% may be chosen. This is one of the more "basic" features referred to earlier. On the plus side it also has an auto-defrost feature which enables the dehumidifier to operate at temperatures as low as 36°F. This is several degrees lower than many other models and particularly important if you choose to use this dehumidifier in an area, such as a garage which, in cold weather, could cool to a few degrees above freezing point. This feature also makes the CFM40E suitable for use in a basement but it must be stressed that this dehumidifier is not able to cope with very large areas. One reviewer complained that it did not dehumidify his basement as effectively as his previous dehumidifier, a 70 pint model! For a small basement (around 400 sq ft) this dehumidifier will be fine. Additional features of the Soleus CFM40E include three fan speeds and a continuous drain feature. With continuous drain a hose (not supplied) may be attached to an outlet on the dehumidifier and run to a drain or sump into which the water can discharge. This removes the necessity for regular emptying of the water container. Consumer reaction is very favourable. A very large number of "five star" ratings.